Most of the EFCA Collection is processed, with many of the items also available in the Library's circulating collection. The Archives also includes EFCA yearbooks (annual reports). The Collection is available by appointment to scholars researching the EFCA. Please note that a more complete EFCA collection can be found at the EFCA Headquarters in Minneapolis, MN. Their unique holdings include church files, which consist mainly of church anniversary pamphlets. The Swedish Collection has been organized by Dr. David M. Gustafson. It contains periodicals and books in Swedish, generally pertaining to the Swedish Evangelical Free Church of America (previously the Swedish Free Mission). 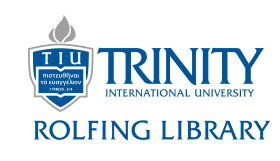 It also contains texts from Trinity's predecessor, the Swedish Bible Institute, as well as books published by Chicago-Bladet and John Martenson Publishing. Additionally, it Contains the J. G. Princell collection, with Swedish and English texts from his personal library. Finally, there are Swedish editions of D. L. Moody's works, and several works by C. O. Rosensius, P. P. Waldenström, Fredrik Franson, Josephine Princell, and Frank Mangs.